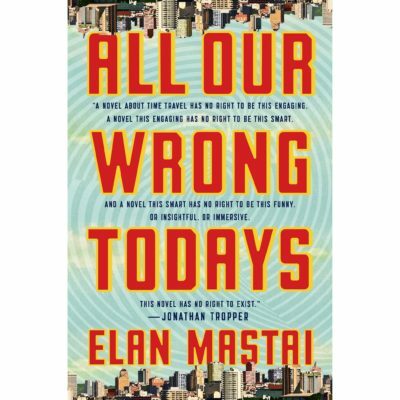 All Our Wrong Todays is a full-on, self-aware, almost satire of any time travel story in a way that asks the reader to accept their regrets as they are. In the book, the protagonist, Tom Barren, attempts to account for why the reader lives in the reality that is present and how that was all his fault. The book strives in its attempt to convince readers that in this fabricated future, Tom grew up with his own sense of reality. Utilising the detailed structure of every point of Tom’s reality and explaining the non-detailed questions by answering with more of a philosophical explanation, the book allows you to become continually immersed in its world. It also shows a lot of parallels with the belief that any kind of utopia is purely subjective. In the reality that Tom describes, all food comes in pill form and world peace has been achieved, yet rock and roll never came to be as a result of there never being the creation of a counterculture. In a way, All Our Wrong Todays shows a perspective of how we as a society can continuously strive for a perfect world, yet the most positive outcomes come from the imperfections in life that can’t be resolved. The book also attempts to speak on this theme through Tom’s father, who becomes distant from his family in trying to improve the future with his creation of time-travel. Yet, this is ironic because why would someone need to travel back to the past if all of society’s problems have already been solved? However, the one flaw in an otherwise fascinating novel was the love story, where Tom’s continued romance comes at high cost to humanity. Despite this, the characters are all likable and allow the reader to empathize with Tom in a lot of scenes. All in all, the novel is a great piece of science-fiction that deserves the attention of the public with its philosophical view on the state of imperfection and perfection itself.